This spring semester, because of the support received from across the community, the STC Starr County Campus Psychology Club awarded its first scholarship to a club member who graduated from STC in May 2012. The $1,000 STC Starr County Campus Psychology Club Scholarship recipient was Ruby Rivera, who graduated from an associate’s degree in psychology. 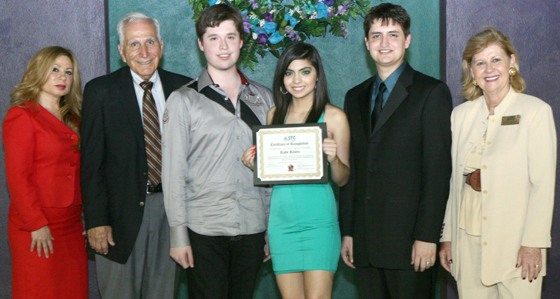 Rivera was presented as the first recipient of the scholarship at the STC Starr Campus Graduation Convocation on May 4, 2012. Rivera, who is a Rio Grande City High School 2010 graduate, will transfer to The University of Texas-Pan American this fall to continue her studies toward a bachelor’s degree. She aspires to teach at the high school level and simultaneously attend graduate school to earn a master’s degree in counseling. South Texas College’s Starr County Campus Psychology Club has been in existence for three years with STC psychology instructors Eli Sarabia and Alex Sarabia as the advisors. During this time, the club has performed community service including participating in Relay for Life and the Manuel Benavidez Walk-a-Thon and donating of clothes to Starr County Community Closet. Club members have also coordinated educational events like the first “Starr County Role Models Get Inspired Conference” and fun events like “Starr County’s Got Talent.” Most importantly, the club has engaged in numerous fundraisers including car washes and holiday basket raffles, all with the hopes of raising scholarship money. The Starr Campus Psychology Club will grant a $1,000 scholarship every spring semester to an STC graduate to incentivize students to continue their studies beyond earning their associate degrees. To be eligible to apply for the scholarship, applicants must meet some criteria including being an active club member, maintaining a cumulative grade point average of at least 3.0, and submitting an official school transcript, resume, and essay about future academic and professional goals. Aside from Eli and Alex Sarabia, the scholarship selection committee was composed of Ruben Saenz, STC Starr County Campus coordinator; Auristela Lung, STC college success and Spanish instructor; Rosa Gutierrez-Sarabia, STC mathematics instructor; James Blair, STC criminal justice instructor; Veronica Trevino, STC financial aid specialist; and Elizabeth Lopez, STC Starr County Campus student activities specialist. For additional information about the club and its activities call 956-872-6724 or 956-488-5898. At the May 4 STC Starr County Campus Graduation Convocation are STC District 1 Board of Trustees Representative Rose Benavidez; Ruben Saenz, Alex Sarabia, scholarship recipient Ruby Rivera, Eli Sarabia and STC President Shirley A. Reed.